Arm Map Explorer recreates all the functionalities of Google Maps on your desktop while expanding them with new extras. Map Explorer lets you locate and view any place on the planet using dynamic interactive maps. These maps are draggable, which means there is no need for you to click and wait for graphics to reload each time you want to view adjacent parts of a map. Basically, viewing locations on maps in Map Explorer resembles the way you use a regular street map. In addition to features, which are offered by Google Maps, Map Explorer allows you to view a map with a coordinate grid on it, get precise coordinates of any location on map and move to a needed location on a map based on the coordinates you specify. With the help of the object tree, you can instantly locate and view capitals of states, large cities, world`s landmarks, monuments, international airports and other objects. You can save a map as a file or print a map on paper to use it as a regular paper map while on a trip or journey. 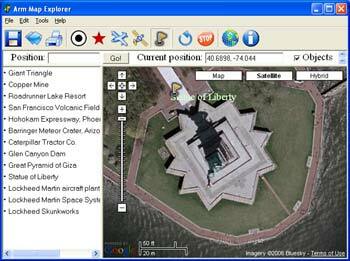 Map Explorer is great for exploring different locations. It can, for example, help you study geography, both physical and economical. The program will display a satellite view of any location, be it a hydroelectric station, a city or any other large object. You can zoom the view in and out and pan in any direction. Statement: First, please download the orginal installation package by clicking the download link. Of course you may also download it from the publisher's website. Using Arm Map Explorer crack, key, patch, serial number, registration code, keygen is illegal. The download file hosted at publisher website. We do not provide any download link points to Rapidshare, Hotfile, Depositfiles, Mediafire, Filefactory, etc. or obtained from file sharing programs such as Limewire, Kazaa, Imesh, Ares, BearShare, BitTorrent, WinMX etc. Software piracy is theft. If you like Arm Map Explorer please buy it.